Window air conditioner insulated side panels and window fan unit side panels keeps cold out in the winter and keeps heat, dirt, dust and bugs out in the summer. Get custom made panels to perfectly match your unit. 2 custom made insulated inserts per set. White waterproof and air-tight PVC coated material insulated side panels. Semi-rigid insulated side panels. Not cheap accordion type side panels. Specially designed as a compression press-fit insert on each side of your window air conditioner and in front of existing accordion panels to keep the winter cold air and draft out of the home, and heat, dirt, dust and bugs out in the summer. Inside insulated with a special, 3/8 inch semi-rigid insulation. 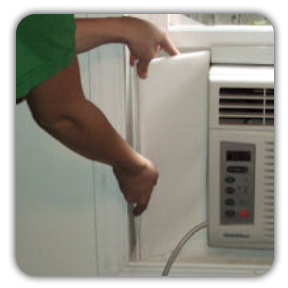 Be sure to measure the exact height and width of the openings on each side of your window air conditioner for a tight compression fit. Custom made window air conditioner insulated side panel inserts made to tightly fit left to right and up and down, within the left and right side openings of the window air conditioner unit. Please double check measurements before submitting your order.